Summary: An unforgettable depiction of a specific, horrifying experience, Waltz with Bashir nevertheless has universal resonance. 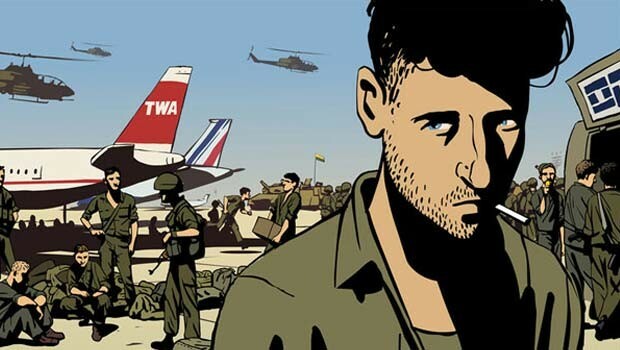 Taking its title from the surreal image of an Israeli soldier, oblivious to the gunfire around him dancing trance-like through a Beirut street junction and spraying bullets beneath the gaze of posters of Bashir Gemayel, Lebanon’s assassinated president elect, Waltz with Bashir is a deeply harrowing yet moving meditation on memory. The film is inspired by director Ari Folman’s experience of serving in the Israeli army during the 1982 Lebanon War, or at least his efforts to recall it by interviewing ex-comrades. For Folman, the son of parents who were Auschwitz survivors, the act of offering testimony is bound up with issues of personal responsibility. Employing animation to present his journey proves ingenious, capturing the elliptical nature of memory and allowing the film to flit between conscious and subconscious sequences with all the logic and illogicality of the human brain. Scenes in which Folman interviews his fellow combatants, a psychologist and the journalist Ron Ben-Ishai, who provides an eye-witness account of the war but also a broader, political framework for the soldiers’ personal experiences (one recalls dousing himself in patchouli to identify himself to his comrades in the dark; another joining up to be seen as more manly) are presented in rotoscoped animation, heightening the crazed surrealism of the wartime sequences. These frequently verge on the cartoonish, whether depicting soldiers goofily spoiling a group photo on their tank or firing on an Arab boy with an RPG launcher. The film opens arrestingly with a friend relating to Folman a recurring nightmare in which a pack of 26 ferocious dogs pursue him through the streets. It directly correlates to his wartime experience – he was entrusted to shoot dogs whenever his platoon entered an enemy village at night – and the triggers a desire in Folman to probe his own memories. But his are limited to a dream in which he and two comrades arise naked from the ocean on the night of the Sabra and Shatila massacre to discover female refugees fleeing from the Christian Phalangist militia, allied to the Israeli army and out to avenge the death of Bashir. This scene, repeated throughout the film, is lyrically disquieting and the young mens’ bodies move with a hypnotic fluidity. As Carmi, one of the other soldiers in the dream tells Folman though, he can’t remember the incident and it may well never have happened. Although a disturbing reminder of a shameful period in Israeli military history, the film is more about the therapeutic process of recollection. The animation is consistently coloured by the subject matter, with explosive yellow and orange hues followed by shadowy darkness. The marked contrast between backgrounds and the people portrayed increases the sense of disconnection, until at the very end of the narrative, Folman has the scales lifted from his eyes and learns the part he played in the massacre, with the film switching to actual footage. An unforgettable depiction of a specific, horrifying experience, Waltz with Bashir nevertheless has universal resonance.